BANGKOK, Thailand (CNN) -- Nobel Prize-winning democracy activist Aung San Suu Kyi's health has improved, and there's no cause for concern, a spokesman said Tuesday. Aung San Suu Kyi met with a doctor Monday after being barred from seeing him over the weekend, said Nyan Win, a spokesman for her party. The doctor put her on an intravenous drip, Nyan Win said. The physician had done likewise on a visit Friday. The doctor who treated her wasn't her regular physician. That person is Tin Myo Win, who was unexpectedly arrested Thursday, Nyan Win said. The charge is unknown. The doctor and his wife have never been involved in politics, he added. The arrest of the doctor followed the detention Wednesday of an American man who reportedly swam across a lake to gain access to Aung San Suu Kyi's house. A fence is being added around her house, following the intrusion. It was unclear who ordered construction of the fence. Aung San Suu Kyi, 63, has been under house arrest for 13 of the past 19 years, and is rarely allowed visitors except for her doctor. Her detention is scheduled to end May 27. 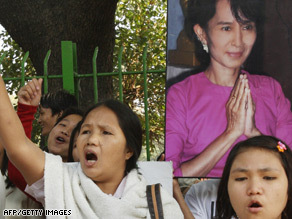 Aung San Suu Kyi was first detained in 1989, and authorities have extended her detention regularly. She won the Nobel Peace Prize in 1991. The U.S. State Department said Monday it was "concerned" about the government detaining Aung San Suu Kyi's personal physician and withholding medical care from her. Aung San Suu Kyi rose to global prominence during protests in the southeast Asian country in 1988. She was placed under house arrest before her party won the 1990 general elections, which the ruling military junta did not recognize.